It took me years to become Yotam Ottolenghi's champion, for the mere reason that both he and Sami Tamimi make what I consider a very familiar to me food. When I eventually got Plenty from Amazon and then recently Jerusalem: A Cookbook review copy from their publisher, I recognized the brilliance of the subtle twist on simplicity. 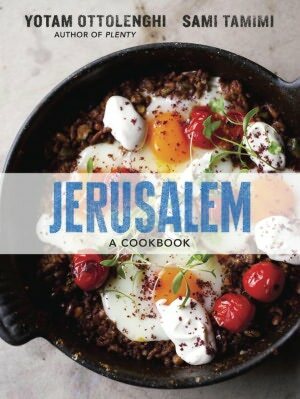 I was ogling the upcoming Jerusalem: A Cookbook for months. I am not accustomed to pre-ordering, but I've been following the press coverage and occasional recipes that showed up in the media, so I was tempted to add Jerusalem to my queue. When I opened the package that was sitting on our front stoop, I let out a shriek. My obsession, fed and sated. As Jonathan is particularly crazed about anything aubergine, I decided on this recipe to inaugurate cooking through the book. At a first glance the recipe seems similar to many Middle Eastern baba ganoush recipes, only for the zest of lemon that elevates it as reinvented. To think that I almost didn't add the lemon zest seems now sacrilege. Read this Huffington Post Taste rave review I couldn't have put it better. Char eggplants on a stove top, grill or on a broil mode in the oven. Turn around so it is charred all around. When broiling, I removed the stem and forked the eggplant all over the surface of the skin. Let eggplant cool once charred all around. Peel and with a fork separate into strands. Add 2 tablespoons of lemon, mix and let strain in a fine mesh strainer for up to an hour. Cook's note: I add the lemon immediately so the eggplant won't oxidize too much. I let it strain for 20 minutes only. Add the rest of the ingredients including 1 tablespoon of leftover lemon juice , mix, adjust for salt and refrigerate until serving. We loved it today as we were having it for lunch with olive bread during Hurricane Sandy. You all out there in Sandy's path, stay safe! We had some tree damage and our driveway is now blocked but we are safe. The proportions in this recipe are different from the book as well as the directions. My husband is a huge fan of egg plant based dishes. I love the addition of pomegranates. That will leave it with sweet yet tangy taste. Love the look of this book. I envy my husband who gets to visit Israel and also Jerusalem every other year. I have to tag along next time just to explore the culture and great food. A delicious combination! Delicious looking and sounding. That sounds like my type of comfort food! I am in an eggplant craze and I have to confess after discovering shakshuka some years ago I have been itching to learn more Israeli delicacies! Thanks for sharing. I got my copy of Jerusalem the day it came out and made my first dish (cauliflower with tahina) that very week. This eggplant recipe is one of the next on my list! Love your pictures. Aha..you paired eggplant with pomegranate..such gorgeous looking recipe S! Something similar yet different from Indian baingan Bahrta. This has some similarities to the bharta I make.. It looks really delicious, and those pomegranate add a pop of color.. Lovely! Absolutely unique. I like the combination of flavors. This is so unique, creative and delicious! I love the combination of flavors! I love that feeling of excitement when a long awaited package comes. Love the contrasting colors in this dish. Pomegranate is my mom's favorite but I've never used it for my cooking. They look like jewels and so pretty!! I love eggplant and this is one new way to enjoy. Thanks for sharing this! What a delicious way to use pomegranate! What a great combination of flavors! The pomegranate gives this such a pretty pop of color. Great photos, as usual. Such a fun spread! Must get my hands on that book! I love eggplant, what scrumptious flavors! Both beautiful and so tempting...it must taste incredible!! !